Imagine, for a moment, your life stretched out before you. As with all things, there is some good and some bad. Think of how you would react to these ups and downs. I think it’s safe to say that most of us would respond positively to those up-moments, right? The same is true for reacting negatively to down-moments. I mean, everybody loves to be happy and nobody really wants to be mad/sad. Now, imagine if you saw the possibilities those down-moments hold. Maybe a lesson that needs to be learned or a situation that teaches you how to help others? I get that sometimes there is no spinning a down-moment, but how much more up-moments would we have if we viewed everything as a possibility instead of a problem? I would imagine down-moments would significantly drop. 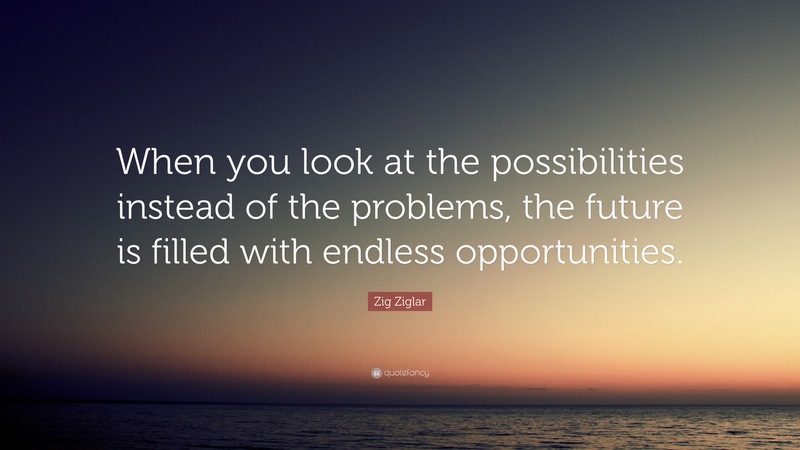 Endless opportunities exist when you see the possibilities.